It’s hard to believe that eight years ago today saw the closing day of the Double Visions exhibition at the University of St Andrews Gateway Galleries. 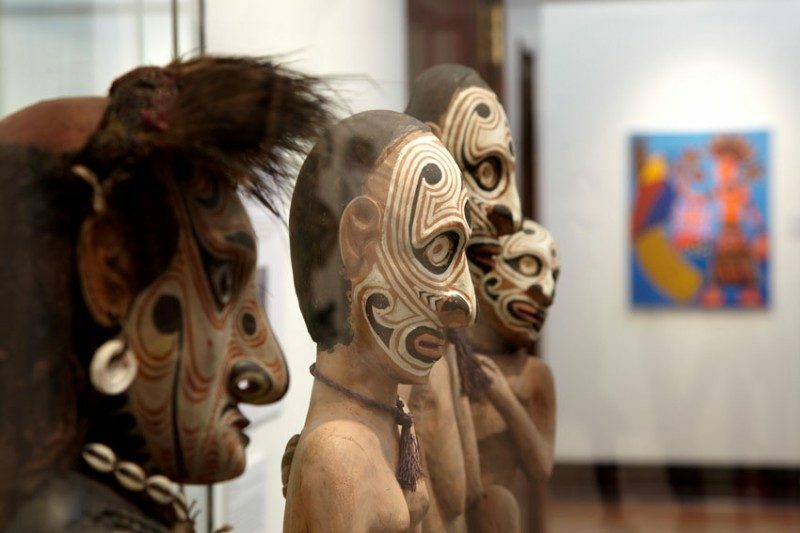 This exciting exhibition was a rare opportunity to see work by artists from Papua New Guinea (PNG). A larger version of the exhibition had been shown at Kirkcaldy Galleries from 15 May to 20 June 2010, before moving, in an abbreviated version, to the Gateway Galleries in St Andrews. The artists involved transformed cultural tradition into contemporary expression through their choice of materials, subjects and an awareness of life in PNG today. Specially featured were paintings by the major artist Mathias Kauage OBE (1944-2003). Also exhibited were the delicate figurative scuptures made from recycled metal by Tom Deko; oils on canvas by Martin Morububuna; Sepik river carvings by Teddy Balangu, Lucas Tangun and Kaua Gita; and a range of textiles based on the traditional ‘bilum’ woven bag technique, featuring Cathy Kata.